Dime Store Inspirations – I love that! My friend Beth recently blogged about how the source of her creative inspiration goes back to the dime store goodies of a by gone era. I love that! Dime Store Inspirations, I think she is on to something. Beth and I have been friends forever and craft partners too. We continually fuel each others fire and I couldn't have a more devoted friend, confidant and creative inspiration than her. She and I have been crafting all our lives and concurrently we took on selling our items on eBay all the way back to 1998. Now, in addition to eBay we have our Etsy shoppes and occasionally we will sell to stores or even do an open house. It's fun to look back sometimes on how we have each evolved our own style and vision. Back in the 90's Beth made these pin cushions and I am lucky to own a set of them. 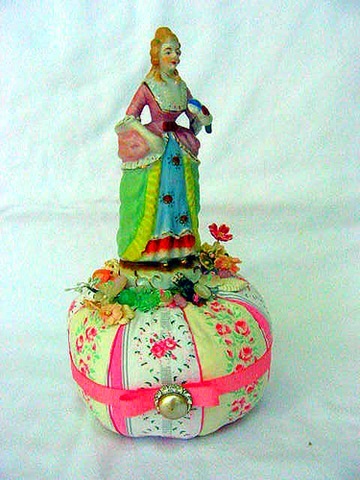 Then Beth became inspired by some vintage pin cushions that I have in my personal collection. 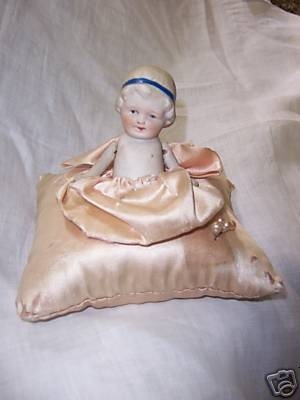 Those old pin cushions made with a bisque figurine on top. Beth added her own vision and style to create a distinctive look to her pin cushion creations. 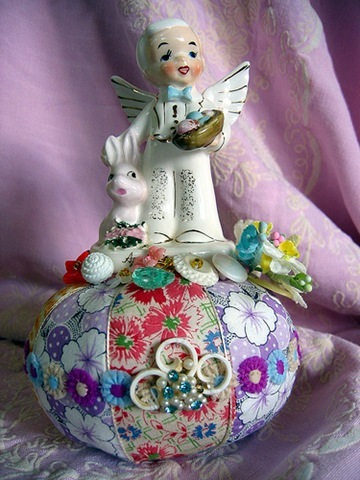 Beth has been selling her pin cushion creations on line since 2002 and has sold over 600 of them! That sure is a lot of figurines! I am always scouting around to find her cute ones and I have a box full right now that I can't wait to take to her. One of Beth's pin cushions even appeared in Romantic Homes! Yeah Beth! Now, of course Beth didn't invent the pin cushion or the tote bag. I certainly didn't invent aprons and papier mache has been around since the beginning of time, right? 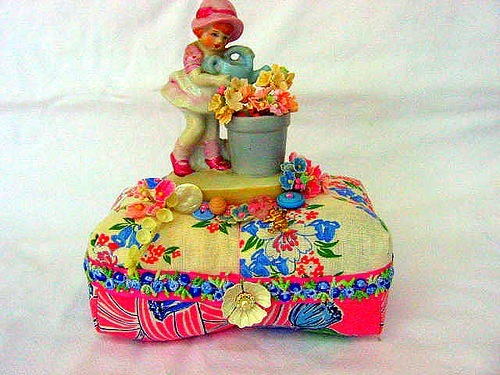 What is special about my creations, Beth's pin cushions, your creations is your personal vision, your STYLE. So stay true to your style and your own personal vision. I actually had a little glitch with the original listing. I received some lovely comments on that one too, but lost the whole thing and couldn’t figure out how to retrieve it so I finally just retyped it all. You’ve described Beth and I perfectly! Both of you are so clever and creative – I love your style! 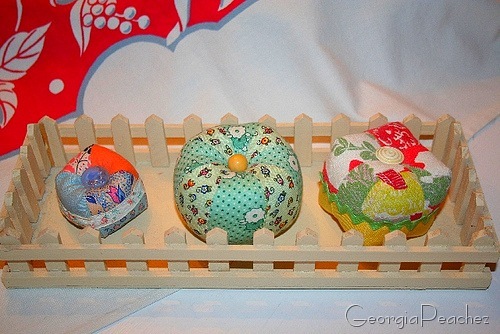 And I am always delighted to see her adorable pincushions. They are truly works of art to be admired- and used! Hi Suzy – Great post. Isn’t is wonderful to have a buddy who ‘gets you’? I’m sure you and Beth have great times together. What a wonderful post and such an encouraging closing statement. You and Beth have a wonderful story of friendship as well as exceptional talents. Kudos to you both. I have a figurine of a bride and groom obviously made from the same company as the singing angel! So sweet!